Despite the government schemes to rehabilitate manual scavengers, the scavenging still continues. The caste stigma attached to it has become inseparable—jobs of sanitary workers are reserved to SC/STs, even in this modern era of computers and the internet! Stop allowing builders from becoming ‘agents’ who hoard black money! Curious case of disqualified voters! 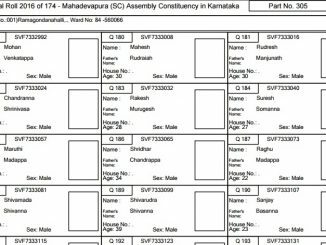 CEO Karnataka published the final electoral roll on January 11th. Surprisingly, over 2,000 voters have been disqualified from the list. The father of the groom shares a personal account of how one can celebrate something as grand as a wedding, without creating too much of a burden on the environment. Imagine cycling through the length and breadth of Karnataka? That’s exactly what this NGO wants to do. And while they are at it, they want to plant 60,000 saplings across the state. Bengaluru saw a sudden eruption of protest by garment workers on Monday and Tuesday opposing the Central government’s new PF policy. One woman garment worker’s story gives us a glimpse into their lives. Anecdotes and basic studies show air pollution causes lung diseases in Bengaluru. But, nobody is collecting the data that can support strong measures to curb pollution.